I've discussed the challenge and the thrill of growing ferns from spores on the blog before. With nursery prices they way they are- who hasn't fantasized about propagating a whole slew of ferns from the powdery spores of your cherished full-grown fern? 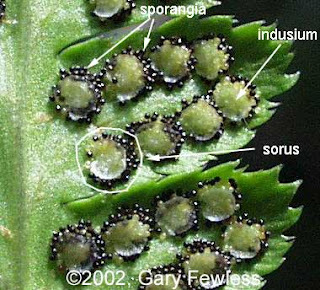 I poked around a bit and found a How-to guide that makes it sound positively easy to propagate ferns from spores. The special ingredient seems to be patience. "The spores are then ready to be sown. I use a clear plastic container with a sterilized earthworm compost mix, but there are many other options. The spores are dusted on the top of the mix and the lid put on the container, which is then placed under cool white fluorescent lights that are turned on for 14 hours a day. The spores must be out of direct sunlight."